Ayni Projects is happy to announce the return of the Concerts at the Farm series on Saturday evening, April 16th. Ailish Schutz, Ayni Projects founder and Ian Dogole (www.iandogole.com), musical director, invite you to the Munay Farm sanctuary to experience the captivating contemporary melodic percussion instrument from Switzerland called the Hang. Joining Ian in this unique musical collaboration is one of the world’s most prolific Hang music performers – Matt Venuti (www.mattvenuti.com). Together, they will take you on a musical adventure that features several generations of the Hang and two new PANArt instruments called the Tubal and Hang® Gudu (among the first ever in the U.S.). Ian’s instrumental compositions and Matt’s heart-inspired vocal songs will be among a diverse range of musical settings, which will include both ensemble and solo performances. For added depth and color, Ian and Matt have solicited the stellar talents of Robert M. Powell (www.robertpowellmusic.com), a virtuoso performer on guitars of all types, as well as a highly acclaimed composer and producer. If you’ve ever heard the entrancing sounds of the Hang, you already know how uplifting and transporting this wondrous instrument can be. If you are new to this instrument, get ready for a transformational experience. As is customary at our concerts, the evening will commence with some tasty snacks, sweets and libations and opportunities for all of you to commune with one another before getting comfortable in our lovely sound temple where we can take in the spring evening with the intoxicating sounds of the PANArt sound sculptures. And when the concert is over, you can go sit by the pond and if the frogs are in just the right mood, they will sing for you. Proceeds from this concert will go to support the Chaupin School in Carhuaz, Peru. Tickets: $35 – Includes a substantial appetizer, something sweet and a beverage of your choice (wine or non-alcoholic). Additional appetizers and beverages will be available at a nominal price. Purchase tickets online at http://www.ayniprojects.com/news-and-events/events.html. * Exact concert location will be emailed upon completion of your online purchase. For over 30 years, Ian Dogole (www.iandogole.com) has articulated his vision of Global Fusion Music as a multipercussionist, bandleader, educator, recording artist, composer and producer. He has released seven records and a DVD as a leader – Along the Route, Dangerous Ground, Ionospheres, Night Harvest, Convergence, Crossroads, Outside the Box – Jazz Journeys & Worlds Beyond and Ian Dogole & Hemispheres In Concert (DVD). Ian has recorded and performed with artists such as Hamza el Din, Tito La Rosa, Richie Cole, Paul Mccandleuss and Alex de Grassi. He performs on a wide variety of African, Middle Eastern and South American percussion instruments, including the udu, cajon, Hang, African talking drum, kalimba and dumbek. Ian has received numerous grants, including a Jazz Performance Fellowship from the National Endowment for the Arts, three recent grants from the San Francisco Friends of Chamber Music (SFFCM) to present musical tribute concerts in honor of jazz legends Woody Shaw, Wayne Shorter and Randy Weston, and multiple grants from the Marin Arts Council. Ian is very active as a music educator – having presented assemblies to more than 60,000 elementary school students in his four seasons with the San Francisco Symphony’s Adventures in Music program, three seasons presenting a global world music appreciation series to students at Redwood High School and a recent presentation of a world music appreciation course for senior citizens through the Osher Life Learning Institute at Dominican University. Ian has also offered his music education programs through numerous nonprofit organizations, including Bread & Roses, Young Imaginations, Youth in Arts and Young Audiences of the Bay Area. Composer, performer and masterful instrumentalist Matt Venuti tours 10 months out of the year singing his original compositions while accompanying himself on the Swiss-made Hang and Gubal; innovative new instruments made famous through the internet but extremely rare to encounter live. The sounds from these instruments have the potential to impart a powerful and positive effect on the listener, and Matt is a gifted player who takes his audiences on a melodic and rhythmic journey while singing songs that “open the heart, quiet the mind, and touch the soul”. It’s a magical experience that is at once contemplative, energizing enchanting and fun! Matt also weaves intriguing dialogue about the instruments and his experience as a composer and musical shaman who has persevered and grown through some of life’s profound challenges. Matt’s compositions and performances have been commended by his world-wide fans. He has a history of performing at progressive happenings like the TED Conferences and diverse concert venues either as a soloist or with his San Francisco-based ensemble, The Venusians. Visit Matt’s website at www.mattvenuti.com for video excerpts of his performances and demonstrations of the Hang and Tubal. The Hang is a contemporary musical instrument, often referred to as a “sound-sculpture” created in 2000 by Felix Rohner and Sabina Schärer, owners of a small company called PANArt in Bern, Switzerland. By the year 2013, following the evolution of several generations of several thousand Hang instruments, PANArt had decided to focus on a new creation, the Tubal. 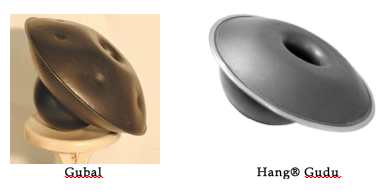 Both the Hang and Gubal are made from a steel-based alloy called Pang®, a patented material developed by the instrument makers themselves. This material is partly what gives their instruments such a captivating sound with the slightest of effort. The non-linear, somewhat cosmic playing field, the richness of tone, the unprecedented versatility of playing options and the dynamic response to the slightest touch has caught the attention of the masses and has generated a legion of devoted players and listeners worldwide. The Hang® Gudu is a hand-played percussion instrument that projects the enchanting sonic properties and resonance of Pang®, a composite material developed by PANArt, while honoring the indigenous udu clay pot from Nigeria. Matt Venuti was the first to transport this recent creation to the U.S and tonight, Ian Dogole will be performing on what is likely the second such instrument to cross our borders.